The exhaust back boxes are universal fit so will fit on any car. How can I fit the exhaust?. depending on type of exhaust system currently on your car this exhaust will need to be weld, it will cost around £50 - £60 for a professional stainless steel exhaust specialist to fit it. Single 4" oval tailpipe design. Looks and sounds great with deeper, louder than standard bass exhaust tone. Back pressure is reduced producing power gains. IMPORTANT FOR CARS WITH OLIVE FIXING REAR SILENCER. Single 3" round tailpipe design. Looks and sounds great with deeper, louder than standard bass exhaust tone. Back pressure is reduced producing power gains. This Sportex system is manufactured from aluminised 2" bore mild-steel with a competition spec. BLACK 3" rolled tailpipe. The skidded silencers are of the straight through absorption design. NOTE: We chose a 2" bore tube to manufcture this system from, as we want to ensure the system tucks up well to give maximum ground clearance, and also to provide a generous clearance over the rear beam. Peugeot 207 1.6i 16v turbo GTi models. 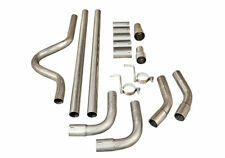 Stainless Steel T-304 Exhaust Cat Delete Pipe. Air Induction Kits (272). Fits from the turbo to the 2nd Catalytic Conver. Gain more performance due to more air flow. 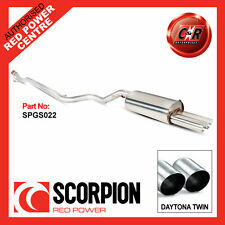 IMPORTANT FOR CARS WITH SLEEVE FIXING REAR SILENCER. Single 3" round tailpipe design. Looks and sounds great with deeper, louder than standard bass exhaust tone. Back pressure is reduced producing power gains. A Scorpion Stainless Steel Cat Back System. Northern Ireland, Southern Ireland, Highlands, Orkney, Shetland, Isle of Wight, Isle of Man. Peugeot 208 GTI 1.6. (Non Resonated - Louder). Our highly competent sales team are always more than willing to help, whether you’re unsure of fitting specifications or just making an enquiry. Sportex performance tubular multi branch exhaust manifold designed to produce more power and torque by using tuned pipe lengths that are free flowing and less restrictive then standard. Sportex exhausts are constructed using high quality aluminised steel for the pipe work. To back up their quality all Sportex systems carry a 30 month warranty. NOTE:The image shows the actual SPORTEX Peugeot 107 CENTRE EXIT rear silencer, no bumper modifications are required to fit this item! (Resonated Quieter). A Scorpion Stainless Steel Cat Back System. Northern Ireland, Southern Ireland, Highlands, Orkney, Shetland, Isle of Wight, Isle of Man. Peugeot 208 GTI 1.6. Our highly competent sales team are always more than willing to help, whether you’re unsure of fitting specifications or just making an enquiry. Twin 3" round slash cut tailpipe design. Looks and sounds great with deeper, louder than standard bass exhaust tone. Back pressure is reduced producing power gains. STAINLESS STEEL T309 MANIFOLD. PEUGEOT 206 8V. Stainless steel manifold made from inox (T-309) will gain 10% power to your vehicule.This stainless steel exhaust header will give you a horsepower increase at maximum rpm with a substantial torque increase resulting in much better throttle response at any rpm. Twin 3" round tailpipe design. Looks and sounds great with deeper, louder than standard bass exhaust tone. Back pressure is reduced producing power gains. Looks and sounds great with deeper, louder than standard bass exhaust tone. Back pressure is reduced producing power gains. Twin 3" round tailpipe design with slight outward flare at the tip.BP55T3. Single 4" round Jap style tailpipe design. BP59J4 Note: this is NOT a universal silencer but a direct fit to the exact model of car shown. Looks and sounds great with deeper, louder than standard bass exhaust tone. This product is basically the centre section of the exhaust system built without the usual silencer fitted. They sound great with deeper, louder than standard bass exhaust tone. Back pressure is reduced producing power gains. 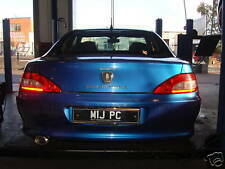 PEUGEOT 306 1.9 TD & 2.0 HDi SPORTEX EXHAUST TAILBOX WITH BOXTSA STYLE TAILPIPE. To back up their quality all Sportex systems carry a 30 month warranty. The Sportex systems and tailboxes are manufactured from aluminised mild steel with polished T304 stainless steel tailpipes. 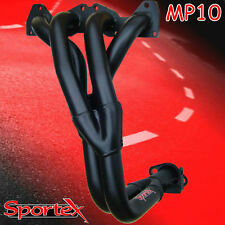 Sportex performance tubular multi branch exhaust manifold and De-cat pipe is designed to produce more power (approx 6-8bhp) and torque by using tuned pipe lengths that are free flowing and less restrictive then standard. This well engineered performance exhaust 'RACE TUBE' directly replaces the original silenced centre-section on all PEUGEOT 306 1.9 Turbo Diesel CAT MODELS. The Race Tube fits directly to the original cat downpipe, and runs through to a standard tailbox, or any performance type tailbox that would fit to a standard Peugeot centre section. This well engineered performance exhaust DE-CAT pipe directly replaces the original Catalytic Converter on all Peugeot 106 GTi models built in the period May 1996 through to Sept 2000. (106 GTi's built after Sept 2000 have a position for a lambda sensor that is NOT present on this de-cat). Single 4" round tailpipe design. Looks and sounds great with deeper, louder than standard bass exhaust tone. Back pressure is reduced producing power gains. Peugeot 306 2.0 XSi S16 GTi 6 Sportex Exhaust inc Race Tube - Single 3"
To back up their quality all Sportex systems carry a 30 month warranty. The Sportex systems and tailboxes are manufactured from aluminised mild-steel. This 306 system has a polished T304 stainless steel tailpipe with a Single 3" ROUND internally rolled design. 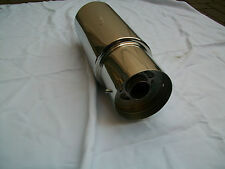 Single 4" round jap style tailpipe design. Looks and sounds great with deeper, louder than standard bass exhaust tone. Back pressure is reduced producing power gains. IMPORTANT FOR CARS WITH OLIVE FIXING REAR SILENCER. Twin 3" round tailpipe design. Looks and sounds great with deeper, louder than standard bass exhaust tone. Back pressure is reduced producing power gains. PEUGEOT 309 GTI 1.6/1.9L. PEUGEOT 205 GTi 1.9L 3 DOOR HATCHBACK PETROL Manual 1986-1993. PEUGEOT 205 GTi 1.6L 3 DOOR HATCHBACK PETROL Manual 1984-1994. High quality T304 Stainless Steel Pipe. Oil Coolers & Hoses (42). Single 3" round tailpipe design with slight outward flare at the tip.BP55S3. Looks and sounds great with deeper, louder than standard bass exhaust tone. Back pressure is reduced producing power gains.